All done. Yes, all done. This was my 8th top in the upcycled blues series that I finished. Obviously I am not finishing the quilting in the same order. From a distance it's sort of bland. 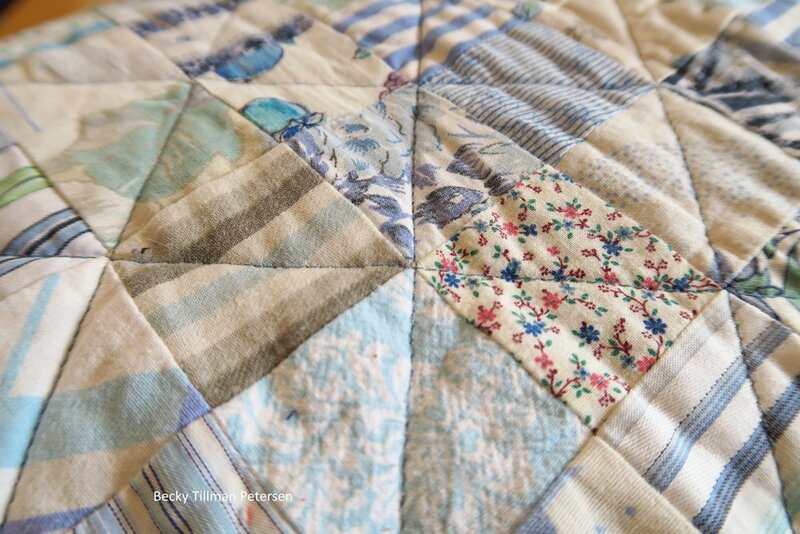 But up close, especially for people who like a quieter quilt - it's a very relaxing and pretty one! The key to this one was to choose fabric that was printed on a white or off white background. That is actually funny, isn't it, since pretty much all fabric is printed on a white background? Anyway - I tried to choose fabrics that would read "open, quiet, mostly white or slightly off white." I did mess up here and there and used a bit too creamy or off white fabrics, but it worked okay in the end. Here's another up close. 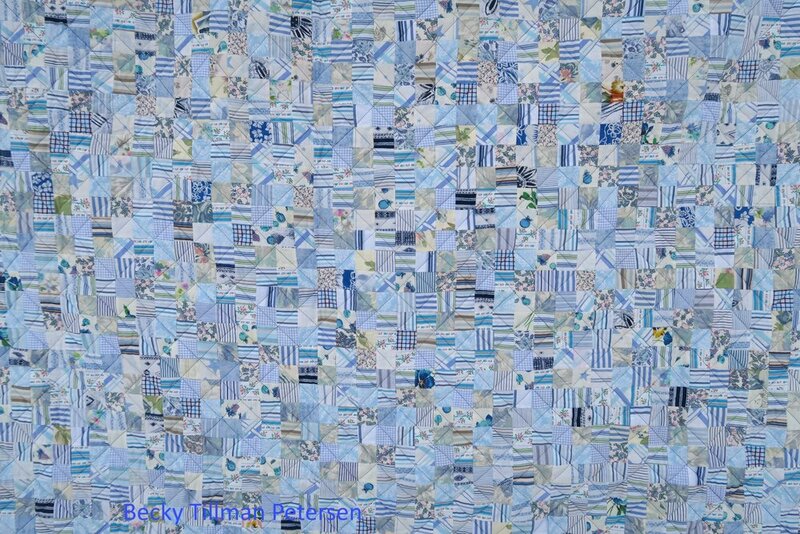 I actually have a lot of blue fabrics that are printed as a pastel blue background and I tried to stay away from using those though occasionally one may have slipped through. I used 2" strips and squares. When you step back from the quilt is what you see. It does really make you want to look for those interesting little things in it. Along that line, I hope to buy a fat quarter of Waldo fabric and put one of those in a kid's quilt somewhere. Wouldn't that be fun? Just put one little head of his in the middle of a bunch of busy squares and call it "Where's Waldo?" And the quilt roll....I like them - and this one, with the cross hatching quilting (yes, it took a long time!) shines! I forget to get a picture of the backing outside - so I went ahead and spread it on the table and took a picture. I really was too lazy (or cold) to go back outside and hang it back up on the line to get a picture only of the back! While it is pieced, I had enough of this one one large duvet cover to make the entire backing. Very pleased. We live near a relatively busy road, so often there are cars going by on the road when I take these pictures. Sometimes I wonder what people are thinking when they see me hanging these things up and taking pictures of them. I had previously written up the pattern for "Made Ya Look" - and I simply used that one - only of course I added the outer border and then a piano key border to the outside. Obviously the pictures in my regular Made Ya Look pattern do not show only blue fabrics - in fact, there are a lot of black and whites in that one. It's here. Go ahead and download it if you want it. It's free. Our days are gradually going to get warmer and warmer. Today we should get just above freezing, until by Palm Sunday we'll be up in the upper 40's F during the day. I trust you have a great day wherever this finds you reading. Don't forget, if you need something from my sis, be sure to check out the store!